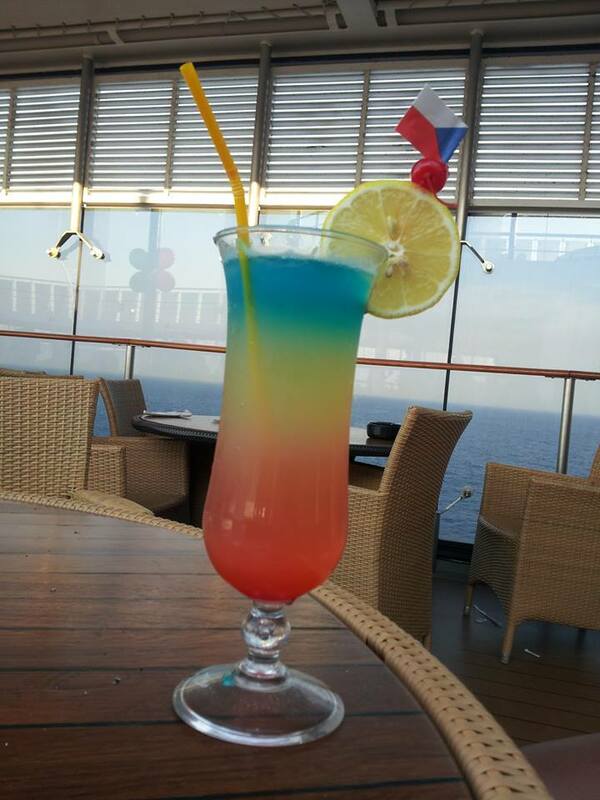 I have had so many people asking me about the drinks packages with MSC Cruises that I decided to do this blog earlier than planned. 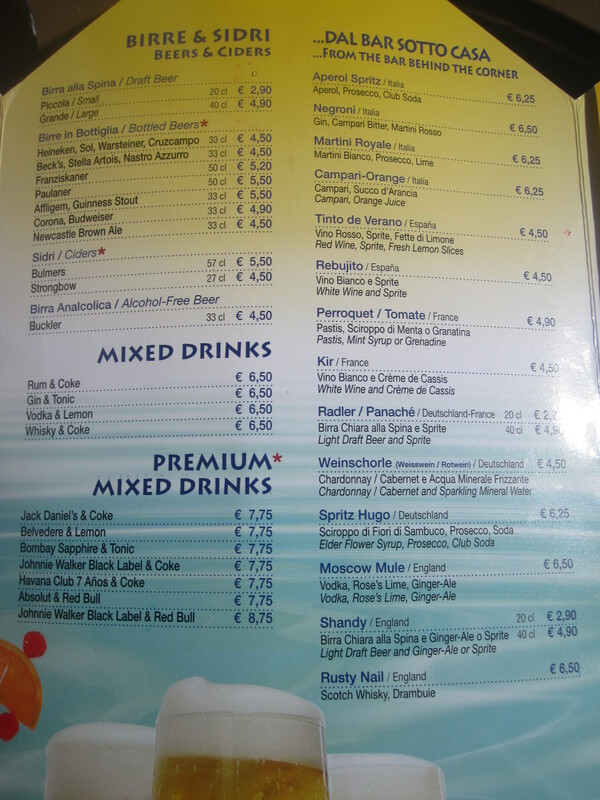 It is also slightly longer than usual as I took pictures of the pool bar menu for you all! I would strongly recommend taking a drinks package. I went with Allegrissimo because it was unlimited, 24 hours per day and from any bar or restaurant. That suited me perfectly. The total cost of the package for ten days was 230 euro. Had I not had the package my cabin bill for drinks and ice cream would have been………………..wait for it……………………….860.89 euro!!!! That is a MASSIVE difference! The package was such good value for money and because I met quite a few people it meant getting rounds of drinks for everyone was also included. They too had the same drinks package so we just took turns going to the bar and the waiter would add each round to one card instead of doing it separately. Made more sense really saying as we were all paying for the same package. One round alone went through one evening at 46 euro, that’s the cost of the package for two days gone on one round of drinks. It just shows how much you are saving by opting for the drinks package. Even if you don’t drink alcohol it’s still worth getting. I was drinking Mango juice like there was no tomorrow. Each bottle was 2.70 and I would get maybe 5 a day as they were only small, that plus the 15% worked out at roughly 15.52. Add a bottle of water to that, an ice cream and a Vitamin Bar drink and already you have gone beyond what you are paying per day for the package. I booked the Allegrissimo before boarding so the 15% service charge was already included in the cost. If you book when onboard you will be billed at the end of the cruise for the 15% service charge so it’s much more cost effective to book BEFORE you sail. Cheers! 16.50 per day and included unlimited wine by the glass, draft beer, soft drinks, fruit juices and mineral water with dinner. There was also a kid’s version of this package for 9 euro per day. Classic Wine Package 115.00 euro total and included 6 bottles of wine plus 7 bottles on mineral water. Some of the above were on offer at check-in so the prices could be ever so slightly lower than they would be if you booked at home but not by a lot to be honest. 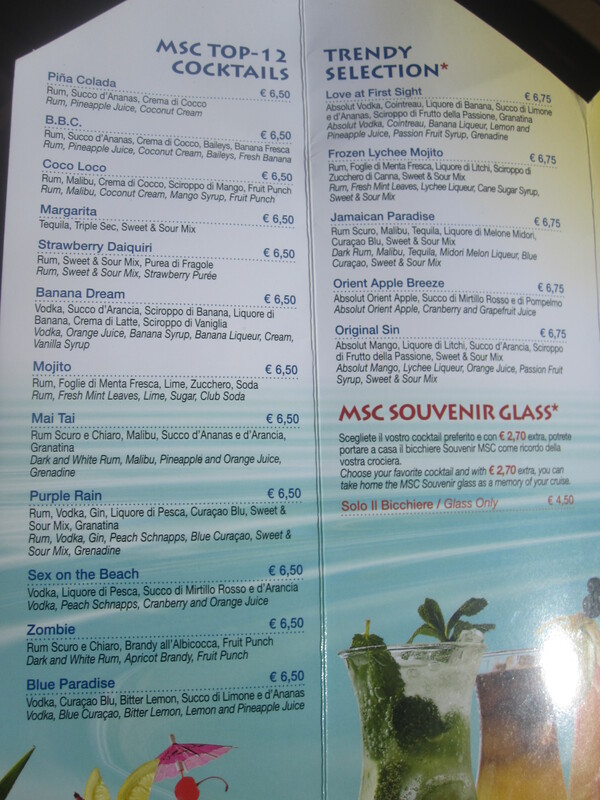 Below are some images of the Pool Bar Menu, to see an enlarged version simply click on the image. 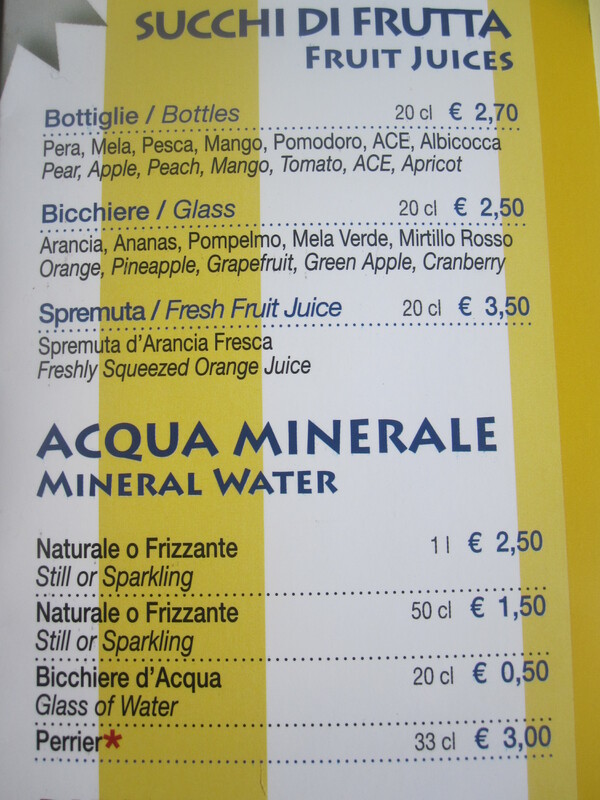 Note that everything marked with a red star is EXCLUDED from the Allegrissimo package. I was surprised at just how much choice there was for the Allegrissimo package. You always wonder when you book drinks packages if the menu will be incredibly limited, but I can honestly say the choice was superb! Everything I would personally want was included. Hopefully today’s blog has helped you with your drinks package decision. 🙂 I can’t say enough times how good I thought it was, give it a try, you can see how much I saved by having it! Over 600 euro!!! 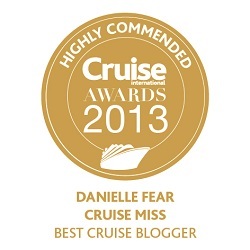 Hi thanks for your in depth review, I’m looking at a cruise & it conmes with the all inclusive drinks package? Would you think that would cover the 15% charge? Thanks in advance? Hi, we are going on the MSC Magnifica in May, does the draught beer or bottled beer come in a lite version? My husband is diabetic so would need a lite beer hopefully in draught as the cheaper package does not include bottled beer. 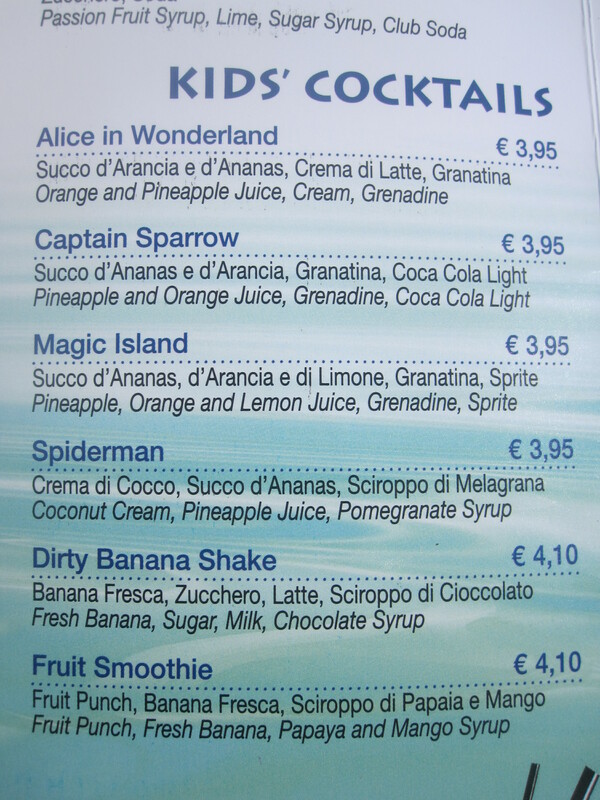 Can you bring alcoholic drinks back to your room when you have the Allegrissimo drinks package? would be nice to have a beer on the balcony in the room. You can have them delivered to your room free of charge, too, if you have the Fantastica tickets. Are any drinks free I.e. Included onboard e.g. Water or soft drinks at self service restaurant or tea and coffee at the buffet. I have only experienced p&o and Cunard where you can obtain unlimited water and juice and also tea and coffee at the buffet. Hi, Tea and Coffee are free with breakfast and also from the drinks station in the buffet restaurant. This is usually open about 22 hrs a day. I wouldn’t recommend it though, it’s not the nicest coffee in the world, although you can get hot water and a tea bag of your choice, i.e fruit tea, peppermint tea etc. On the 3 MSC Cruises I’ve done, you can also get a cold drink here too, usually just an orange squash or similar from the dispenser as well as ice. Hi does a tk e know if there is a non alcoholic version for the all inclusive ? Hello- I am planning a trip on Divina in Sept – Mediterranean. There is currectly 16 people going- 8 cabins. We were told by the pcc @ msc, that ‘everyone’ in the group would all have to be on the same drinking package if unlimited. I never heard of such a thing- I emailed her, then called to clarify. She said it’s because of the seating at dining- so, everyone at the table would have to be on the same package. I’m still confused about it- I’ve traveled on other cruise lines w/ unlimited bev packages, in a group, and never had to be told that the whole group has to get the package. she said if some people in group opt for the voucher packages, then she recommended that all the ones with the unlimited would sit together, those that didn’t get the unlimited would be at another table. it still didn’t make sense. I’m going to be emailing a director to get this resolved. Hi Michael – it depends really how much you think you will drop – alcohol and soft drinks! I still think the packages work out as the best option as they include 85% of the menu and i could spend my daily allowance on soft drinks alone. Hi Danielle, We’re on Fantasia September 7th, and we have booked this Allegrissimo package. We travelled on Splendida a few years ago and did the same with no regrets, it definitely save us some money. Works out at £20 per person per day, which at the onboard prices probably works out at 4 to 5 drinks. That’s not many drinks from breakfast to bedtime! I believe though, that they’ve thinned it down a bit since then, because I’m sure the mini-bar was included, and I’m almost certain bottled beers were too (from what I can work out, it’s now only draught beers). Further, the wine at dinner was by the bottle too. That being said, I’m convinced we’ll still save money. Believe it or not, we are not heavy drinkers! This seems such a great deal I want believe it till I see it for myself – we are booked on Preziosa early sept.
this is extremely helpful Danielle , thank you ! my issue is , as much as I am interested in the Allegrissimo package since I am a drinker , my girlfriend who is traveling with me doesn’t drink alcohol or sodas … but if i want to book the package it has to be for both us … also we only have one At sea day … any thoughts ? Excellent blog. So glad I’ve already paid for the all inclusive package for the Opera on 7 June 2014 from Southampton. Richard were on a port heavy cruise? We are going on one in April, we port every day so i am really debating the pkg, plus we are a family of five! That adds up, we were looking into the tickets i think 14 tickets for soda,etc, then maybe a wine pkg,. I just wonder if we are on excursions all day will we really use the pkg that much, in order for it to pay for itself? I may have missed someone say, but how much pp was the all inc drinks package please and anyone how much kids one is? Doesn’t say or I can’t find it on MSC website! Thank you Danielle. This is a very informative blog. It has helped to convince us to go with a drinks package. We are going on the MSC Fantasia in April for our 20th Wedding Anniversary, can’t wait. Keep up the good work. 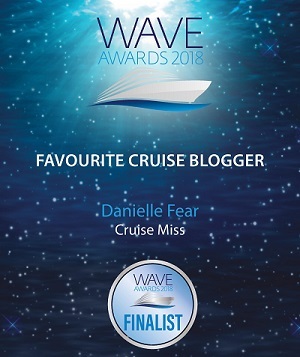 Update on our previous comment Danielle: can you tell us if drinks have to be consumed in the restaurants and bars or can bottles of drink / water be taken off the ship or even to your room? As far as I am aware you can do what you want with it 🙂 I took drinks back to my cabin twice and I always got bottles of water to take ashore. This only applies to Allegrissimo though, some of the other packages do have restrictions. Thank you Danielle that’s really helpful. We’ve also heard that even if you do buy the drinks package, your onboard account gets charged a daily rate for tips etc. Is that so? Loved you very informative blog! I’ve just one question which I cannot find on any of the websites…..What types of wine are available by the glass. I presume they are Italian? My husband and I are wine drinkers but we like our dry wines, I know I may sound like a wine snob but it would be good to know before we get the package. Many thanks and thank you again for all the information, well done you!!!! Hi Joan 🙂 I am pleased you find it useful, always happy to help! I don’t actually drink wine myself so I can’t tell you exactly what was on offer but a lot were Italian. I know that much as a friend onboard enjoyed a glass of wine. There was a lot of choice though so I am confident you would find a perfect dry option. Sorry I can’t be of more use! Hi Chris 🙂 Yes it will already be included in the cost for the drinks package. I pre-booked mine also and paid for it at the end of my cruise via my cabin bill. The 15% was included so all I paid was the price of the package. Hope this helps! 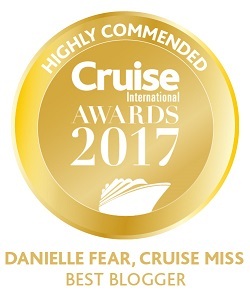 Have a fab cruise! Hi Paul. 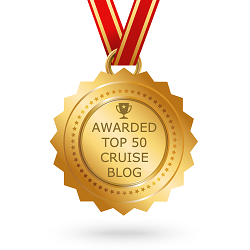 Yes it should do as you have registered for it pre-cruise. I also pre-booked mine, but I paid for it via my cabin account at the end of my cruise. Hope this helps 🙂 Have an awesome cruise!! I agree that the beverage package is well worth it! We were just on the MSC Divina and I can’t imagine what my bar bill would have been not just for alcohol, but for bottled water, coffee, gelato, and pastries. Definitely worth the price and not having to stress about the last night bill under the door. We are a family of 3 and we are sitting with another 3 people at the same table. Do we all have to purchase the same package or just the 3 of us in the same cabin, need to buy the same package? If you booked together you will all have to take the package. If you booked seperately you should just need to take it per cabin. 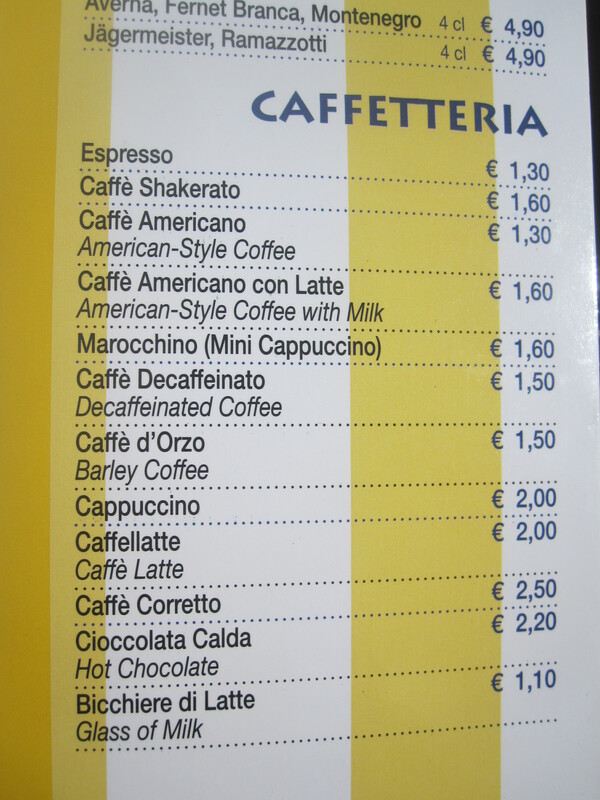 Are the coffees as you picture on the menu? They sure are, I think some others are available though. I did a drink package on the last voyage I did, and it was definitely worth it. The only time I don’t think it would be worth the cost is if you are on a cruise with a LOT of port days. If you only have one or two “at sea” days and everything else is in port, and you are going to be off the ship most of the time, it may not be worth it. Just something to keep in mind. We’re doing the MSC Splendida Med. cruise in January. We intend getting off at every port with just one full day at sea. We would drink wine probably every night and probably a couple in the bar also. Do you think it would be worth buying the Allegrissimo package r would we be better of with a wine package and other drinks pay as you go? I think it would still be worth taking the package to be honest. Plus if you take the package you can take advantage of the fact that bottles of water are also included so you can take these ashore with you instead of having to pay out for it during your travels. We took the option to have the soft drinks package on the princess cruise we did earlier in the year, and we’re so glad we did! To save money you had to have three drinks per day, and in the 30degree heat you’ve done that by midday! Definetly worth it in my opinion!